Our monthly BT bill has been much reduced since we swapped out our BT broadband for Orange, which is a third of the price. We don’t use our landline phone very much either; we tend to use it at weekends, when our BT plan gives us free calls. I know it’s not much, but it annoys me. It is also the first time that we have had these charges. I guess they want to claw a little more money from us any which way they can – even if it’s charging us for not using their call facilities. Before you suggest that we should transfer to BT’s Light User Scheme (the plan for those who make few calls): we can’t. To get onto that scheme, you have to produce three consecutive monthly bills of £12.39 or less. We can’t do that, because BT’s charges for our light call volume ensure that we’re over that threshold. If you are being thrifty and saving money by eschewing itemised billing, this may not mean much to you – but if you are with BT, you will likely find your bill creeping up from next month onwards. The call setup fee – the minimum amount you have to pay, for every call made – is going up by 2p per call. But take a look: the cheaper evening rate, which has started at 6pm for as long as I can remember, is being pushed back to 7pm. Cheeky! I don’t remember being sent anything about this; I just happened upon it by chance. I love the way that, at a time when telecoms companies are falling over themselves to snag custom with an ever-expanding range of attractive deals and initiatives, BT manages to find a seemingly infinite variety of ways to disappoint their customers. Am I the only one fed up to the back teeth with BT right now? Yeah, BT are irritating. There might be a way round it though. I managed to reduce my Grandma’s phone bill for her a while ago – yes, I’m a good Grandson! I simply called BT and cancelled all the ‘added extras’ that she didn’t need or use and kicked up a bit of a fuss about how much she was paying – once we’d got over the language barrier they gave her all her extra services free of charge and switched to a more economical tariff which included cheaper mobile calls (she makes quite a lot when calling her doting grandchildren!). It is news to me that I am charged for the 1571 service I thought this was free. I will check that out on next Bill. Thanks Miss Thrifty you are on the ball. I would suggest switching to Talktalk. You can get a package from Talktalk which includes broadband, line rental and free calls to landlines in the UK at any time for £20 per month. I can’t pretend that Talktalk are a pleasure to deal with (though neither in my experience are BT) but they are certainly a lot cheaper than BT. We switched from BT about three years ago and halved our bill in the process. I also noticed recently that I am being charged for caller display despite not having a phone that can even display information of any sort. Very cheeky BT. I keep meaning to call and cancel it but haven’t so far so this post is a good reminder! It’s a one-sided change of the contract you have with them. If you want to, you can end the contract on that basis within a certain time period, probably 14 days. I have been with BT for over 3 yrs, i have never use my landline as i have a mobile contract. My bills were coming to about £25 a month, they have been like that for about a year. Then all of a sudden the last 3 months bills have gone up by about £10, i get my bills online so i dont really check them which i know i should be its been the same for the last year so i never thought it would change, anyway i checked the bill i am getting charged £2.59 a month for not using my phone and also i had caller id on which i think was about another £1.50. So i called and the guy said my bill had gone up because the VAT went up… Helloo its a rise of 2.5%?? Anyway i asked him to take off those added extras but he only seemed to take off the caller ID. So i am now leaving them and going to SKY as they are offering a much better deal. 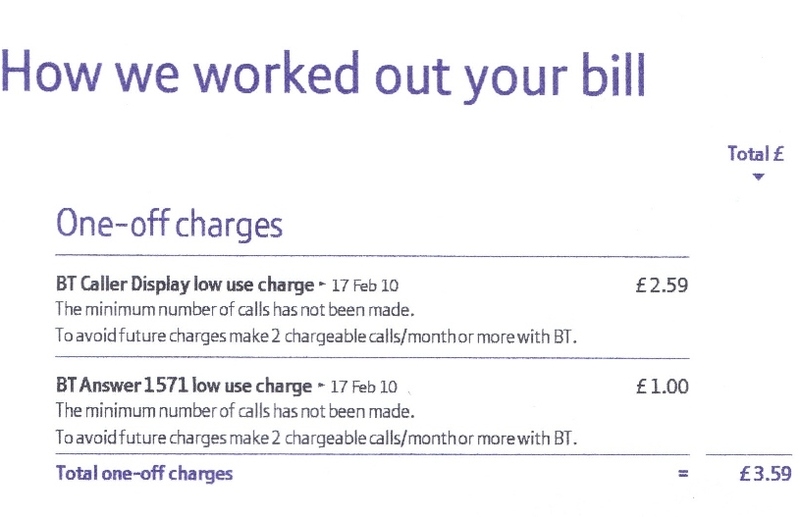 BT are now asking for a cancellation fee of £44 so i am writing a letter of complaint as i am not willing to pay this!